Being the end of the month and all, I wanted to write a bit how Lost Songs of the Nibelungs is getting along. I'm still trying to have a beta-version till Easter. I'm also still confident about getting it actually done. But there are many tiny steps and loose thoughts that barely sum up to form a complete and concise post, so there was some silence on the blog this month. Anyway, since it helps me to write those thoughts and ideas down, I might as well write a post about what's haunting me these days (turns out it will be several posts ... ah well). I mentioned this way back in January: LSotN will have a subsystem as part of the character creation that allows not only to see how the characters in a group are related to each other, but will also provide a player with a social standing, a family background and a selection of skills, advantages and items he might have as a result of his family tree. So much for the theory. I toyed a bit with the mechanic to make this happen and still believe it will be an essential part of the character creation as it really gives a player some sense where his character is coming from and how he relates to the other players. And that should really help getting the group together. It will mean that at least for this part of the character creation all players need to sit on the same table. Character creation is a group effort (and always should be, by the way). Basic roll and interpretation: Every player rolls 3d6. The sum is a characters status in the group, with the lowest result being the highest in standing. Each rolled number represents now a facet of the society the character was born in (1 = royal bloodline; 2 = artisan bloodline; 3 = mercantile bloodline; 4 = artistic bloodline; 5 = foreign bloodline; 6 = magical/fairy bloodline). A triple 1 will mean true royal blood, so that member of the group will not only have the highest status and best equipment, he'll (she'll) also be a direct descendant of a clans leader (advantage: authority). A triple 2 will mean a true craftsman, so maybe it's a character who knows (or has access to) some valuable technique in a craft no one else in a clan is able to reproduce. He'll definitely have good equipment, special skills and an influential family (advantage: versatility). A triple 3 will mean a true tradesman. Those are well informed characters with access to special items and rich parents (advantage: information). A triple 4 will mean a true artist. Here it'll have a selection of exotic skills associated with artists (acrobatics, knife throwing, stuff like that) and entertainment (advantage: showmanship). A triple 5 will mean a true foreigner. This is the lineage of a very different culture, maybe son of an African slave who found his freedom with the fall of Rome and settled among the people of a Germanic tribe or the daughter of an Asian traveler (advantage: diversity). A triple 6 will mean a true fay. This character is a direct descendant of the fay folk and basically a fay himself. Might be a dwarf or even an elf, but most likely something that at least to some extent resembles a human being and has a reason to tag along (advantage: superstition). So the strength and the aspect of a number is connected to the access a character has to a selection of skills, items and advantages. Synergy-effects and relations: To see now how the characters are related, the players just need to compare their numbers. If they rolled the same numbers and built pairs, triples or quadruples, they could be somehow related (with pairs being distant cousins, triples being cousins and quadruples being siblings). Each player has to decide the most important relation to another player. As soon as the players have sorted this out, they have to sort out how they relate to the rest (basically answering questions like "If he's my cousin and you are my sister, he must be your cousin too, right?" and stuff like that. There are always synergy-effects trickling down, so the family of the one with the higher status will provide some additional skill/advantages/items for those of a lower status but related ("You travel with our son, please have this cloak as a token of our appreciation."). A useful interpretation of those 3d6 and the contents of those skill/advantages/items are the biggest problems with this. Not because it won't work, but because it's lots of fiddly bits that need to be written and brought in line. I need a complete list of skills, which is always a drag and hard to do right, then it needs advantages one might have for any specific family background (like with the triplets above). The items need to fit the time (that is ca. 550 AC) and the social "class", but it needs to leave room for advancement. And I need a sensible ratio for all this to work. Something like: 1 die in a bloodline means 2 points to buy skills/advantages/items, two dice in a bloodline mean 5 points to buy stuff (one of them related to the dominant bloodline, so it would be an item with a trade related bloodline, etc. ), three dice means 9 points (with three to be distributed among skills/items/advantages associated with the true bloodline). Status might give a player additional points (so even if a player doesn't come up with doubles or triplets, he might still have some additional points for high status ...) and lineage might produce additional points. All in all a player shouldn't have much more than 10 meaningful choices as far as items, skills and advantages go. It's also something that will most likely take time and happen in the background. For now I'm pretty happy with the result. The 3d6 produce lots of data and I might even put some additional meaning into it (but only if I somehow manage to make this as easy as possible to access, ideally a player rolls and the DM gives him the result and his choices, then they talk about how they are related, make their choices and are ready to go. It is pretty common nowadays to give the players some influence on most of the story-elements of a role playing game. 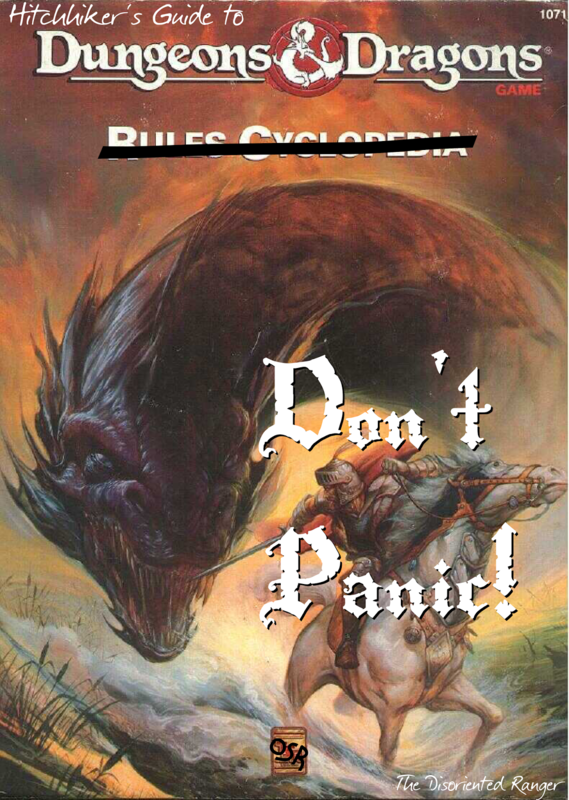 Dungeon World is a good example of that approach. The idea here is to give them power over some of the rules instead. This way the DM still describes the world, but the players produce the rules interpretation (random encounters treasure, all the things the DM would roll on the fly and would explain what the DM described). True to the source I'd suggest a roll of 1d6 by the DM after every such interpretation, with a result of 1-3 in favor of the players and a result of 4-6 meaning that the interpretation is "fatally inaccurate" (with a plus 1 for every 5 levels the players have on average, with a 6 being always inaccurate). DM: You kick the door in and surprise 5 humanoids that seem to live in here. PLAYER [rolls random encounter table for humanoids]: According to the guide those are Troglodytes [quotes monster description]. If the DM comes up with a "no", he'd have to roll the random encounter again in secret and needs to come up with an explanation why the characters might have thought those creatures were Troglodytes (maybe some very smelly Orcs in strange garbs ...). There are several problems with what Lost Songs of the Nibelungs could be and it can be hard to form a coherent setting without getting some of it out there and out of the way. So this will be a collection of thoughts I had about some of the problems a campaign set in the Dark Ages might have and how I intend to circumvent them (instead of solving them, because, you know, those are some harsh topics ...). Let's get on with it (or read Part 1 before that). Well now, see what I mean? Those topics are all somewhat crucial parts of the Dark Ages, one way or another. To design a game set in the Dark Ages will always bring those issues to the table. If they are ignored, they'll sooner or later find their way into the game anyway. Be it because there's a history buff at the table who starts asking the wrong right questions or just the simple destruction of the Suspension of Disbelieve by the use of some half-cooked common knowledge. So if it's not somehow addressed, it'll possibly disrupt the game at some point. Who'd want such a thing? No one, that's who. One obvious route would be to go all "political correct" with this, but it usually is just a can of worms better untouched, because if you try to not piss some people of, you damn sure will piss some people of (I know, it makes no sense at all, but just wait for the next flame war ...). Maybe not the same people either way, but people nonetheless. In the end, if you try to do them all justice, you'll have done no justice at all. Better not tell people what to think, but instead give them all the information and help them make their own decisions. Anything else would be beyond my powers anyway, so why start when writing a game? Another reason for not going that route is to avoid producing another toothless vanilla D&D-Disney fantasy setting by removing/ignoring/misleading all controversy instead of dealing with it. But you see my problem, right? Just writing about those topics could produce all sorts of ill will towards me, the blog or LSotN just by being not clear enough about my position on them (and even then, fer chrissakes). So let's be clear about it. I don't want this discourse in the game, of course. Not like this, anyway. It would be poisonous, as it is always poisonous to point out that we, while playing our games, have reason for guilt. You know, the kind of argument where someone tells you you're a murderer because you just ate that steak. Instead I see a game as a chance to make room for the possibility of experiencing something worth contemplating. Describing slavery as what it is in a setting where such a thing was kind of common and mostly undisputed opens lots of narrative possibilities that might even enrich the game experience. It's not for the rules to tell you how to handle this in your game, but a game can be realistic and neutral about it and maybe even show the opportunities it allows for the game. To be perfectly clear about this, slavery is a crime but also very real. Even today. Using it in a setting may help in understanding why it is a crime, just not by telling those playing the game what to think, but by giving them the opportunity to get there themselves. The game can only be neutral about it, it's for the DM and the players to decide how it is used! This is simultaneously easier and harder to argue than slavery. Historically speaking it is quite clear that women in the Dark Ages where at least not among the famous fighters. But that really doesn't mean they didn't exist. On the contrary, the Migration Period and the end of civilization as the Romans knew it would have been hard on everyone trying to survive during that time. Having some fighting skills could only have helped and there is really no reason to forbid teaching it to women. By the way, there is some evidence that fighting woman where at least not uncommon among Roman gladiators (here is an abstract of a paper on jstor). 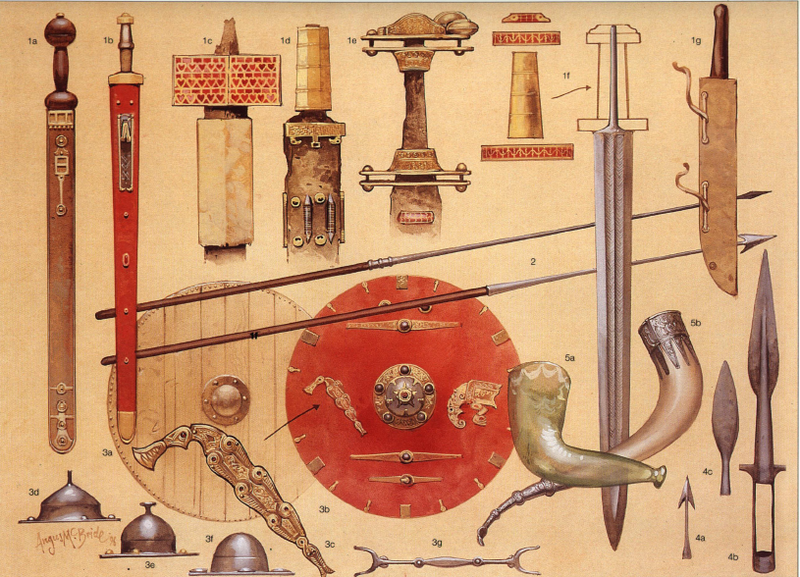 Additionally there are theories that bands of vikings not necessarily consisted only of men. And not just because of the tv-show Vikings or Tolkien's Eowyn, but because of historical evidence suggesting that those Shieldmaidens did indeed exist and fight in wars. So ironically it's today's preconceptions that make it difficult to see in women warriors anything else but exotic birds. To be clear about this, historical evidence suggests that the opportunity to become a warrior was gender-indifferent, especially in the time of the Migration Period (which is the time just before LSotN starts). People had to carve their place out of a hostile environment and had to fight to keep it. Our idea of weak women and strong men protecting them is just misguided. Anyway, it is a problem and, again, it's not for the game to solve it but, instead, to allow easy access to the concept of fighting women. It needs to feel natural in order to allow women players the same variety of character choices as men. 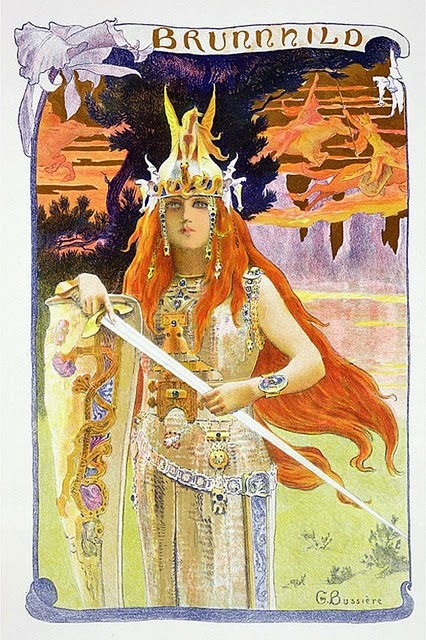 And this is achieved easily enough in a game about Nibelungs by using one of the cast to illustrate what a female warrior could look like: Brünhild, the warrior queen. She is the very impersonation of the Valkyrie in the Norse mythology and famous for her power and fighting skills. Being of high birth sure didn't hurt, but that's not even important right here as our heroes are to form that very basis of being "noble" by being successful (as in "leveling up") and bequeathing that power to the next in line (as they did back then). The game being about the Lost Songs of those Nibelungs leaves additional wiggle room. A small and now forgotten kingdom ruled by a group of female warriors is entirely within the Suspense of Disbelieve and works fine with the historical and the mythological background of the setting. Religion is always an awkward and (sometimes) dangerous topic. There is no doubt, historically speaking, that Christianity helped shaping the political landscape in the Dark Ages and it was a widespread believe in the Europe of the Middle Ages. But still, it was most of all at first a political transition. With the land being as fractured as it was after hordes and hordes of Germanic tribes tried to settle there, it must have been a melting pot of different believe systems and philosophies. And communication between communities was as scarce and random as one would expect during trying times as this. It is not too far fetched to say it took several generations (any many military campaigns ...) for Christianity to become as widespread as it would be around 1000 AD and until then it was a wild mix of several faiths with a high cultural variety. Christianity was the new and uprising faith, while pagan religions like those of the Germanic tribes or the Romans were in decline. Easy enough, one might think. But the Mythology in Lost Songs of the Nibelungs relies heavily on ideas originating in Norse Mythology and Christianity was opposing, destroying and assimilating exactly that generation by generation. So while Christianity is a part of the setting, it is a destructive force. Not necessarily evil, but destructive nonetheless. I believe this to be problematic, mostly because it might perpetuate the idea that Christianity back in 550 AD is the same as Christianity nowadays and that the diachronic criticism (or just historical facts like the crusades a few hundred years later, for that matter) somehow translates to being of that believe today. It's a bit like with slavery discussed above, but something I really don't need in the game, as it gives the wrong focus in either making Christianity the evil force destroying all the magic in the world (which is quite popular, but nonetheless) or making it harmless enough to maintain current sensibilities unruffled - loosing an important driving force of the time in the process. Instead I'd go the way of the D&D and take all of it but the name. It's not only a method that worked in D&D (didn't work well and is criticized for it, but it worked), it's especially an idea that has some strong roots in, to give but two examples, the late David Gemmell's Drenai Tales or Paul Kearney's The Monarchies of God series. So who are the Nibelungs (Part 2)? It's a harsh world the Nibelungs live in, haunted by the evils of a lost civilization. But it's also a world of opportunity for man and woman alike to claim a part of and become legends if it is their fate. Within this legendary realm everything is possible and a Nibelung could rise from slave to king. It is a semi-historical setting they live in, with the pagan believes of the old world struggling and fighting the rise of a new religion that threatens the very fabric of magic itself. The Nibelungs are all the Germanic tribes and their lost songs. I got the chance to write a bit more about King Shroom (link is in the preview), one of my Expanded Petty Gods entries (one of two, to be precise) and thought I'd share the result as a preview (did ask if it's okay, too). For all those unaware of it and reading this (couldn't be many, but anyway): thanks to +Richard LeBlanc the Expanded Petty Gods community project is in its final stages right now and we can expect to see the final product some time next month (March 2015). It will be a massive tome with close to 400 pages full of great ideas and lots of fantastic artwork. I really can't wait to get my hands on it! since he initiated the original reboot of the project. Thanks, man! The Way of the Shroom is a philosophy associated with cults formed by mushroom eaters all over the known worlds worshiping King Shroom, the Patron of those indulging the mind-expanding qualities of certain shrooms, aka Cannibal Godspawn of Mushrooms and Devourer General of the Lizardwars. These congregations of like-minded enthusiasts are, due to their diversity and strange behavior, often enough dismissed as random phenomena. But this might as well be intentional and some scholars argue that even a random or accidental consummation of psychedelic mushrooms may somehow be part of King Shroom’s weird schemes to activate a devote following in a specific area for some bizarre reason or another (see King Shroom post for specifics). To become a cleric devoted to King Shroom a follower has to forsake his physical body and embrace the world of the shroom. A ceremony to this end involves a deadly overdose of poisonous mushrooms in a remote area prone to mushroom growth. The decomposing body will then feed the fungus network and form, in time, a new body for the follower’s soul to inhabit and with the locale of his initiation as his chapel. This is the only known ritual to fully divine the Way of the Shroom. 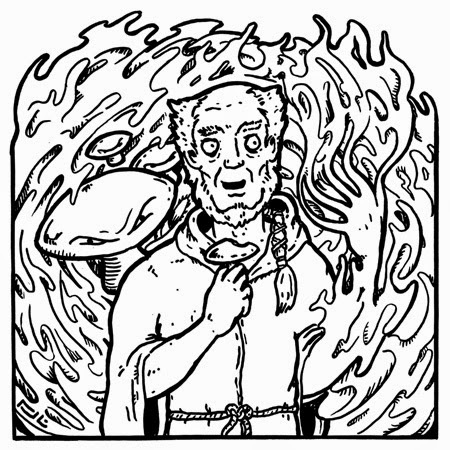 In his new form the cleric may move freely among the fungus network of his holy site, dissolving it in one place and spawning it within minutes at another. He’ll also have the ability to camouflage himself as a group of mushrooms, effectively hiding his presence 95% of the time (the change takes 1d6 rounds minus the cleric’s level, but at least 1 round). He’ll furthermore have the ability to regenerate any damage he sustains at a rate of 1 hp per level per round and may regenerate his whole body within a day if fertile ground is available by releasing spores shortly before his demise. Those spores remain dormant in an infertile environment until the opportunity arises to travel somewhere else, for instance on the clothes of some adventurer or the fur of an animal passing by. For all other purposes this new body functions and (almost) looks like a normal human body. Spells are those appropriate for the cleric’s level, but the fungoid nature of his clergy has a way of twisting the effects of said spells. Healing spells, for instance, come with a (rather harmless) fungus infection that goes away after a period of time equal to the natural healing process of the wounds treated. The dead would be animated by mushroom roots replacing the nervous system of a corpse and a blessing might have rather psychedelic side-effects. Priests of the Shroom have access to all kinds of mushrooms and love beer above everything else. They are by default under the influence of very strong psychedelic mushrooms (being cannibals, of sorts) and their sermon is (at best) opaque for those not seeking the higher enlightenment of the shroom. Mushroom groves are places of worship. If a cleric resides in such a grove, its size will be related to the holy man’s level. Although high level clerics are very rare, their cathedrals would be vast mushroom forests, with fungus networks spanning even further underground. A cleric is aware of everything that happens within such a network. There is a 10% chance per level (every new level allows a new check) that such a grove attracts 2d4 giant crickets, whose eerie choirs then haunt the site every sunset, praising mighty King Shroom. In times of war a number of [cleric’s level] times d100 Fruggar (see +j garrison's entry for the EPG on his blog) will defend the temple under the clerics command. Apologizing to a mushroom one stepped on by accident when visiting a shroom temple is totally appropriate. On rare occasions (chance 1 in 8 in a situation involving mushrooms) King Shroom might “lead” clerics of other faiths to the Way of the Shroom by facilitating an accidental psychedelic experience. The cleric will then in his intoxicated state see the true wisdom of the shroom and act towards the King’s agenda. Not that anyone would understand what’s going on. Even a cleric’s true god would most likely assume that the resulting strange and erratic behavior is just the result of some ill-advised quiche (chance of 1 in 12 to realize what’s going on). King Shroom controls how long the cleric will be hooked and will release the cleric as soon as he has fulfilled his purpose. Sometimes he forgets, though (chance of 1 in 20). Some say the Lizardwars started because the Cannibal Godspawn made a lizard shaman cook an omelet out of some dragon eggs he was supposed to protect, binge-eating them with a smile afterwards. But that is highly disputable. Anyway, the lizard ate the eggs, maybe it started the rumor, too. With all this talk about what system I want for Lost Songs of the Nibelungs, I totally neglected to define who exactly I'm talking about. The reason for this is that I had only a vague picture myself, which is enough for a start, but it needs to be addressed sooner or later. Research is crucial for this and by now I had some time to read about what life had been around 500 AD. I'll start with Germanic Warrior AD 236-568 (Warrior #17) by Simon MacDowall. So far a great read, quoting lots of original sources. Here are my thoughts so far (this is not a review, it's more like a synthesis, of sorts). They are not calling it the Dark Ages for no reason. The time after the fall of the Roman Empire is not very well documented. There are political maps, of course and if you care to read into the subject, there is a lot to be gathered. But most is a matter of debate and there still are a lot of blanks what exactly went down in what is now called Europe or how people lived there. Mostly that's due to lots and lots of change. 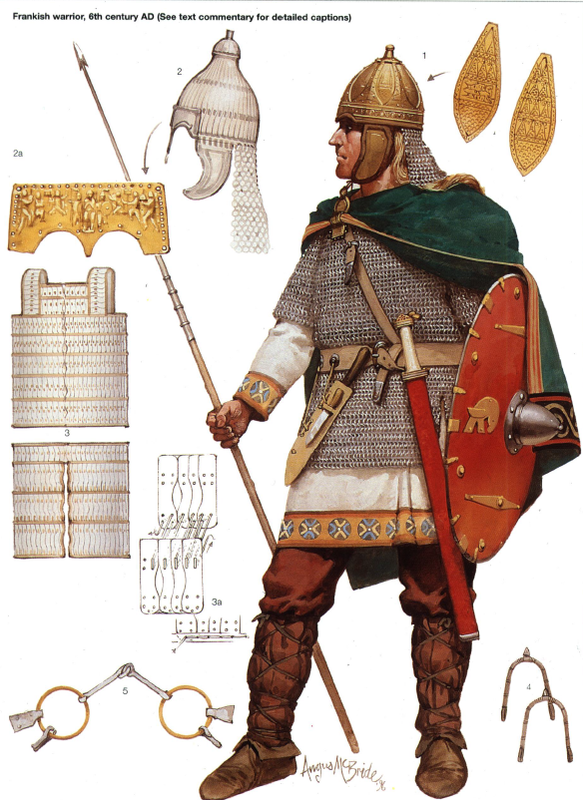 The obvious focus for LSotN is on the Germanic tribes of yore. They had been a culture of warriors, but fractured into families and clans. The Romans appearing at the border forced them together into confederacies against the Roman invasion. Meanwhile mercenaries returned home rich and with ideas about "modern" warfare and education. They became leaders and would form the foundation for noble families to come (which I thought quite interesting). Around the time the Roman Empire had been already in decline (mid 5th Century) several weird coincidences accumulated to what is now called the Migration Period in history books and it's where all is getting confused again. It is a great setting, with lots of opportunities for adventure and exploration. For those settlers it was a strange and new land, full with the ruins of the Roman occupation and treasures to be found. And not one of those tribes migrating there arrived as they had started. Strays from all over the places would have joined them: Romans tired of the taxes, slaves, soldiers, you name it. It's also fair to assume that people still lived at those places invaded by those tribes. The result had been a melting pot of opportunities and that's pure gold for a setting. In many ways tropes of the Western genre apply here, so anyone interested in having a mix of Western and Fantasy tropes could very well start here. It will definitely be part of LSotN. What barbarians am I talking about? If you go a few hundred years back and look at what the Romans wrote about the "barbarians" beyond the border, you encounter as much politics as superstitions and prejudice. What becomes pretty clear, though, is that those Germanic tribes the Romans encountered were strong adversaries in combat, with equipment that was equal to what the Romans had. It was mostly disciplined warfare that got the Romans as far as they got. That notion about equipment is worth expanding on. For a long time historians assumed that those northern tribes had almost no metal armor like chain shirts or banded mail. Mostly because nothing like that had been found in the graves they had dug out. But a far more reasonable explanation would have been (and that's what's agreed upon right now, as far as I'm aware) that they wouldn't bury something as precious as a chain mail, but bequeathed it instead to the next in line or didn't own it to get buried with, as something like this would often be given to a warrior by a chief, who would get it back as soon as a warrior leaves his service. Which means, in turn, that those tribes had been sophisticated enough to carry out all the craft necessary to produce something like that to begin with (miners, smiths, you name it). And not just for those of high birth, but available for many of them (as in, an army). I won't go much into detail here. The simple notion that the Germanic tribes could manufacture what the Romans could (and learned a lot more from them, too) is enough to indicate what they were able to do after the Romans were all but gone. We are not talking "knights" just yet, but (much more appropriate) bands of honor-bound warriors, alleged to some chief or another, fighting and exploring to come back as heroes. 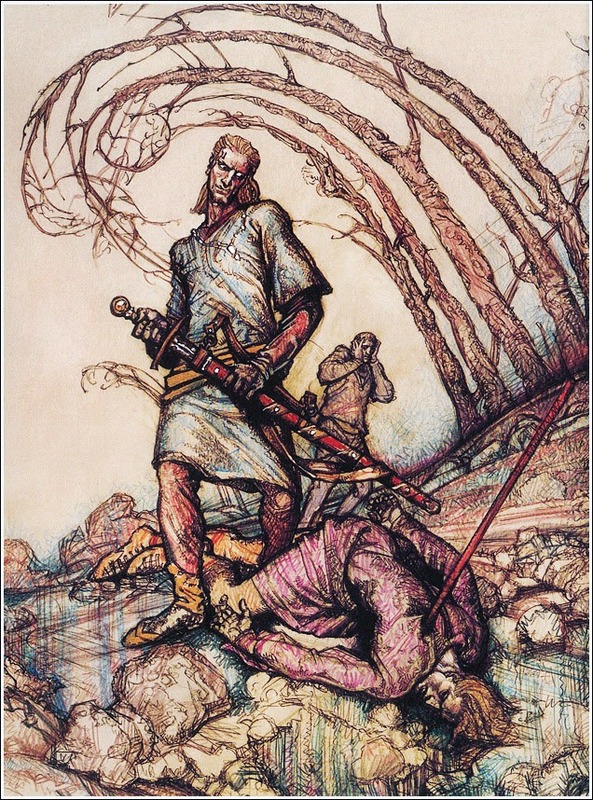 Beowulf comes to mind, but also does Siegfried von Xanthen. So who are the Nibelungs (Part 1)? Historically speaking it would be the children of those desperate and armed refugees that settled among the ruins left by the Romans. They are to explore the deep forests and dark valleys, following whispered rumors of treasure, secrets and sorcery. They will leave their mark on the world, as it is their time. The game is about their lost songs. *For those wondering (or not knowing), the guy did some illustration work for Iron Crown Enterprises.